My parent’s are in town and we headed over to the Bywater for breakfast at Elizabeth’s Restaurant. 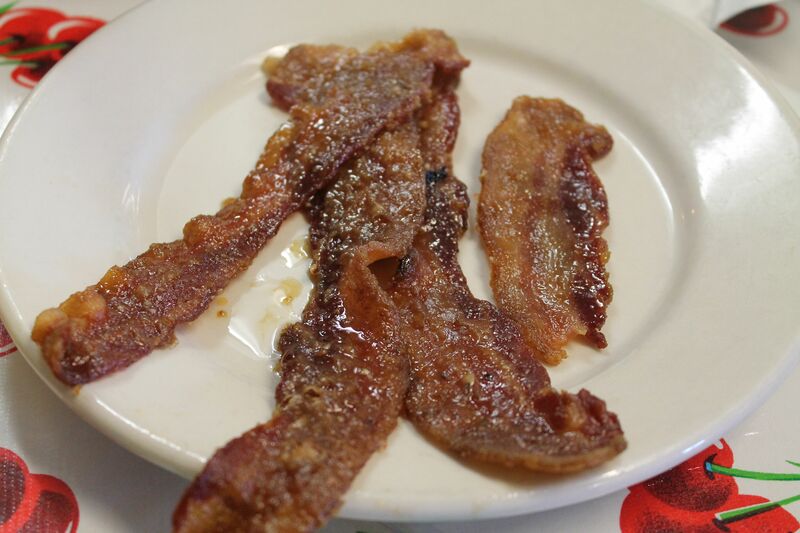 We had to start with the praline bacon – pig candy at its finest! Mix the pecans and brown sugar together until evenly blended and set aside. Preheat the oven to 400 degrees. Position wire racks onto two baking sheets. Lay the bacon strips side by side on the rack, edges not touching. Bake for 10-12 minutes, or until bacon is rendered and browning on the edges but not anywhere near done. NOTE: Time will vary according to the thickness of the bacon so watch it carefully. Remove the pans from the oven and CAREFULLY drain off bacon fat if you desire. When cool enough to handle move the strips very close together. Spread the brown sugar and pecan mixture evenly over all the slices. Put back in the oven for about 8 to 10 minutes more or until the topping is bubbly and the bacon is browned. Allow to cool. The bacon will firm as it sits. 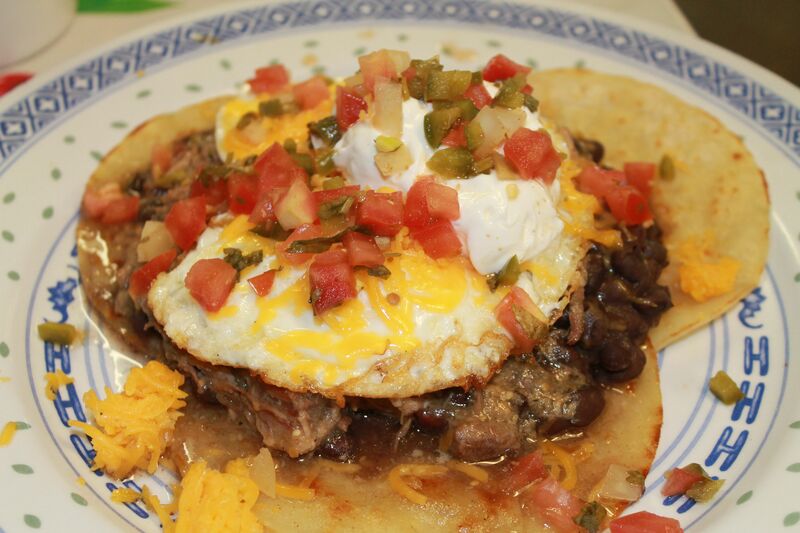 Mom had the huevos rancheros – a wonderful combination of pork, beans, eggs, pico de gallo, sour cream and cheese. 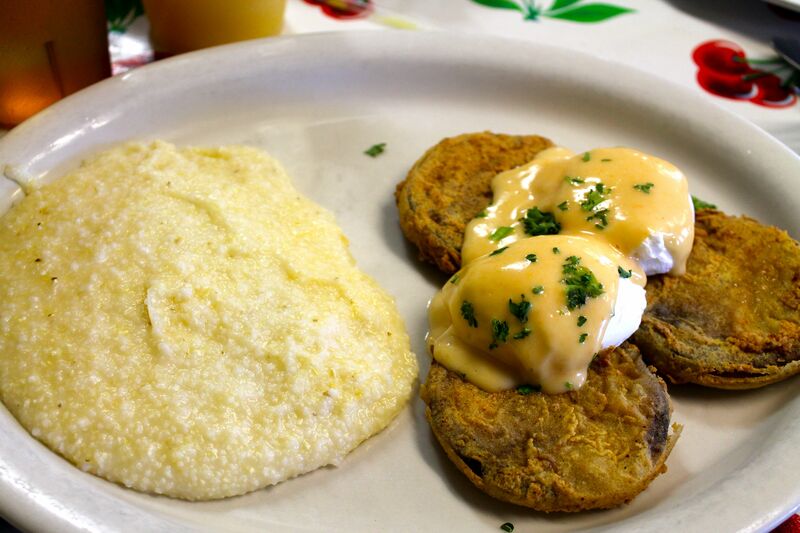 I had the redneck eggs – poached eggs on fried green tomatoes with hollandaise sauce. Tart green tomatoes, creamy eggs, buttery sauce made my mouth very happy. The coffee was strong, the server friendly and the place wasn’t busy at all at 8am on the first Friday of French Quarter Fest.